This product includes these features: Fits 26.75"-29" Wheel Diameter, 8.5" Tire Width, 1 year manufacturer's warranty, Multiple sizes for a custom fit, Fast and easy slip-on fit. 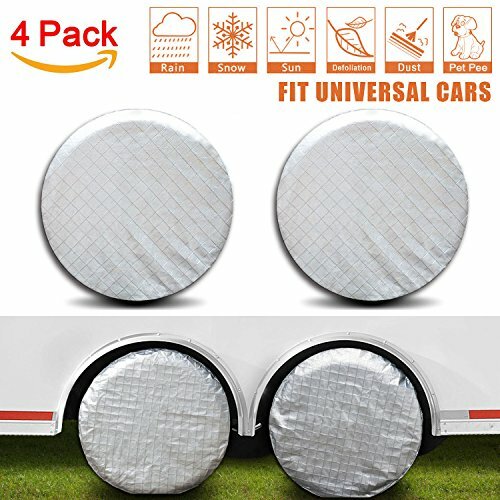 Four wheel covers in each package. Folds up for easy storage. Rugged wipe-clean vinyl material with a soft non-scratch backing. Elasticized back panel for secure fit. Two rear eyelets on each cover to secure bottom flap for a neat look (rope included). 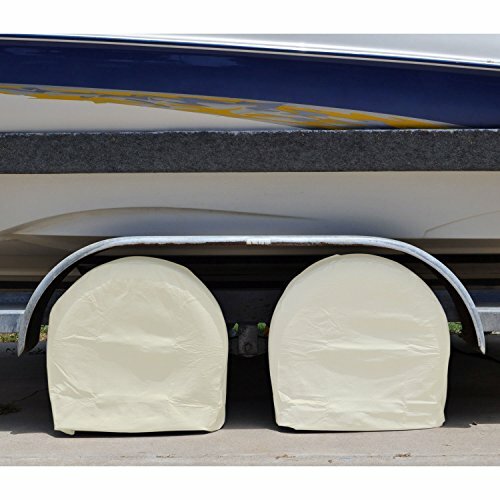 Handy storage bag, Protects tires and wheels against sun damage. Overview: This tire cover is made of waterproof aluminum material, thick cotton wool lining, durable. It is easy to install, remove and clean;no tools required. Folds up compact for easy storage. Fast and easy slip-on design. Hook design is not easy to be blown away by the wind ensures more secure fit. Protect the tires and wheels from sun damage, dirt,rust, corrosion and all types of weather when your vehicle is parked. Keep your tires free of scratches, in order to make your tires life more durable. Because tires left exposed to the sun and other environmental hazards will deteriorate much faster than you might think and could potentially lead to on-road blowouts as well as costly replacement. More serious may have security risks. It has a wide scope of application. 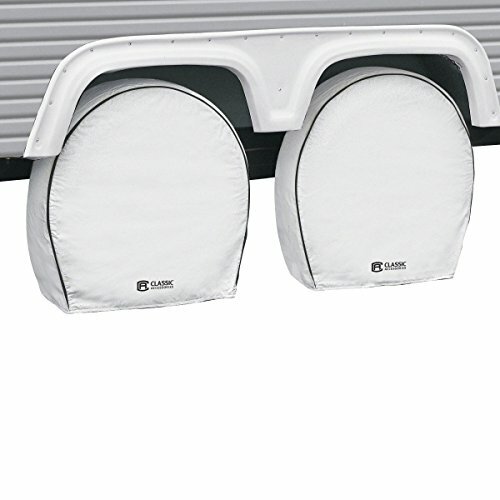 Ideal for use on RV, trailers, campers, cars , trucks and so on. Fits 27" to 29" tire diameters. Specification: Material: Aluminum film material Size: 27" to 29" tire diameters Package Included: 4pcs Note: Please allow 1-3CM differs due to manual measurement. 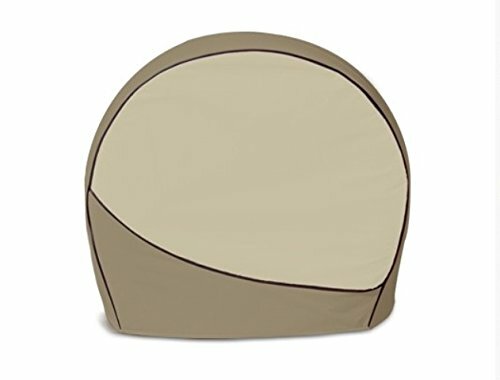 ADCO 3962 Designer Series Tan Tyre Gard Wheel Cover,30" - 32"
ADCO Products, Inc. is a 4th generation family owned sewing business that was established in 1955. ADCO has produced more than 20 million protective covers and assorted soft-goods. Specialists in RV Covers, Trailer Covers, Motorcycle Covers and General Contract Sewing. ADCO products offer quality and value with over 55 years of expertise. About Product Material: Vinyl material Color: Off-White Dimensions: S:26''x25.5''x8'', Fits Tire Diameters up to S: 23''-25.75'' M: 30''x29''x8.5''. Fits Tire Diameters up to M: 26''-28.75'' L: 33''x32''x9'', Fits Tire Diameters up to L: 29''-31.75'' XL: 36''x35''x9'', Fits Tire Diameters up to XL: 32''-34.75'' 1. The Tire Cover made of Vinyl material is waterproof,dust-proof and protect against the sun's harmful UV rays. 2. Great to your tire and wheels prevent from sun damage, rust and dirt when your vehicle is parked. And the tire protector is easy to clean,just wipe-clean with water. 3. Measure the diameter and width of tire before your purchasing, you can also refer to our fitting guide, for any question please contact us for one-on-one service. 4. 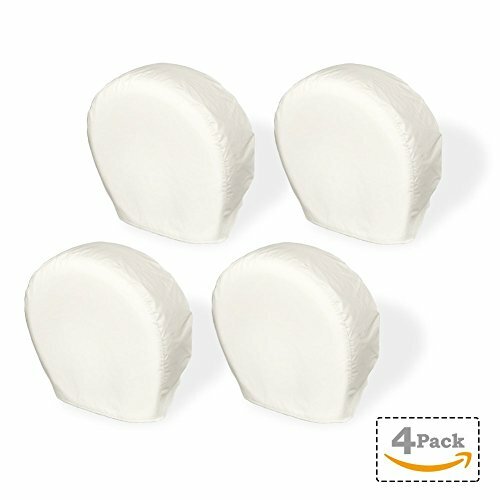 4 pieces in one PE bag. 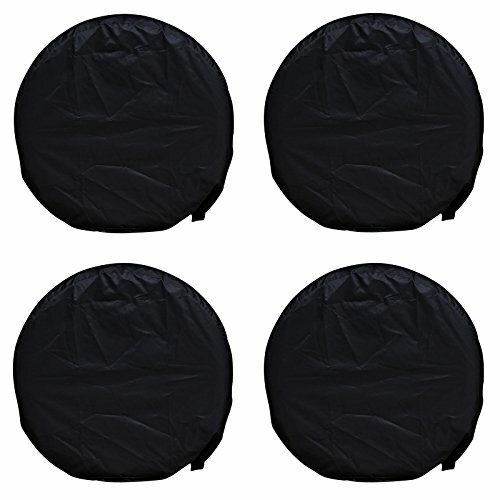 This tire cover is durable and folds up compact for easy storage and fit the Car, Pick-up, Truck, SUV, Trailer. We are totally obsessive about quality and customer service, if you have any questions please get in touch and we will do everything we can to solve them. For more high quality items, please visit Explore Land Amazon Store. This tire cover is made of oxford cloth fabric material which won't tear easily, but very easy to install, remove without using any tools. Hook design can ensure it not easy to be blown away by the wind and can give more secure fit. Protect the tires and wheels from sun damage, dirt, rust, corrosion and all types of weather when your vehicle is parked. Keep your tires free of scratches, waterproof, sunlight proof in order to make your tires life more durable. Our tire cover has a wide scope of application such as RV, trailers, campers, cars, trucks and so on. Who we are Professional R & D and production of tire sets, we use a good material, unique design, commitment to the vast number of consumers to solve tire easy aging, easy to wear problems, bring convenience to your life. What it is for This tire cover is made of premium waterproof Oxford cloth. Easy to install and store. Hook design is durable. Protect your tires from all weather conditions while parked.Wide application for RVs, trailers, campers, cars, trucks. Suitable for 26 - 28 inches tire diameters. Double-sided available. 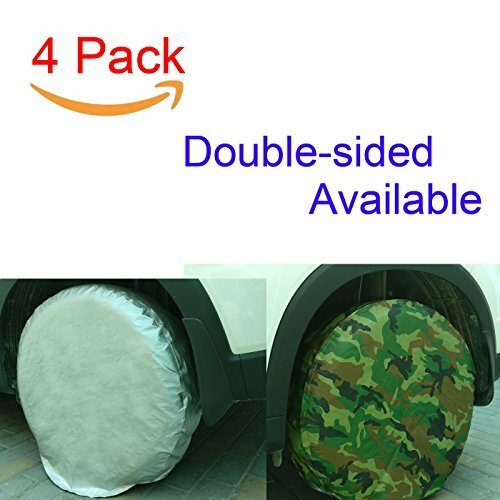 Specification Material: Oxford fabric Size: 26 - 28 inches tire diameters Weight: 12 ounces Package 1 x 4 tire covers Support Any issues or suggestions, please contact us or email us and 1 business day reply is guaranteed. We are committed to 100% customer satisfaction. 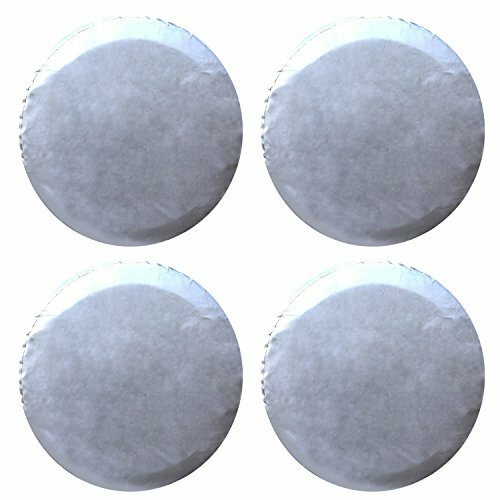 Purchased a set of four canvas covers (found them on ebay). 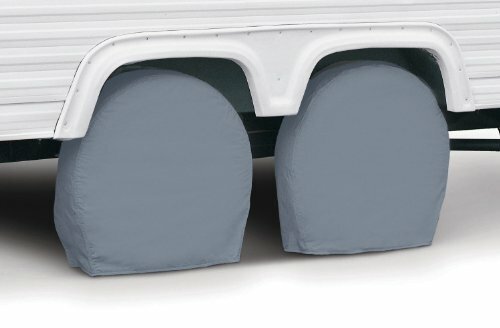 They fit over the wheels and help protect them when the RV is parked. The sun can wreak havoc on tires. 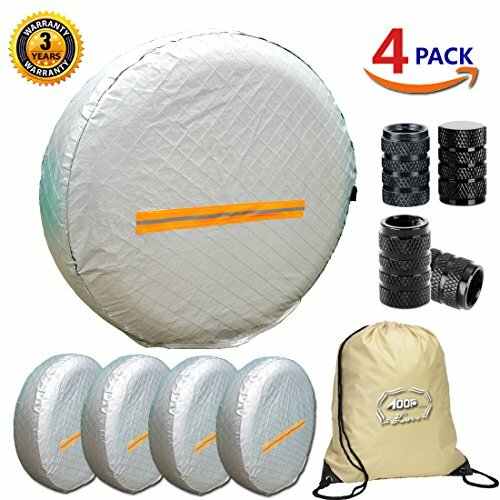 Compare prices on Rv Tire Covers Set Of 4 at ShoppinGent.com – use promo codes and coupons for best offers and deals. Start smart buying with ShoppinGent.com right now and choose your golden price on every purchase.